Increasingly I have the feeling that Mikhaylo Vityk’s Vakula phase was a preparation for the real thing. 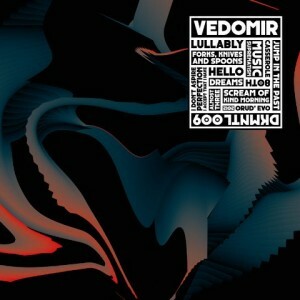 Vakula’s productions showcased his talent, but his house tracks were somehow too dry for me – until Vedomir entered the stage. Already “Orthodox Ambient”, released at the end of 2011 on Dekmantel, was a strong one and now, proving his musical maturity, the Ukrainian presents on the same label the first Vedomir LP in April. „Jump In The Past“ is a perfect start with Michael Knight bass line and slinky chords. The ride goes on with „Musical Suprematism“, sounding like Vedomir has picked up hitchhiking Peter Baumann for a cosmic synth jam with prog rock influences. Here and there Vasiliy Filatov, a talented keyboarder and co-producer, is engaged for some extra stabs. While “Casserole 80th” rounds up synthetic adventures of the A-side, “Forks, Knives & Spoons” opens the B-side for a deep house chapter with soulful grooves and sultry chords. A statement called “I Don’t Aspire Perfection I Accept What I Have” and “Hello” follow the same smooth line. Loud bass and loud screams kick off jacking “Scream Kind Of Morning” for a more upbeat tune, followed by “Dreams”, another highlight of the record with suggestive voice on techy arrangements. D-side opens with spiritual electric organ and sunflower mood in “Lullaby” and concludes with a bit abstract cut called “Orud’Evo”. A very mature album that shows many faces of Vedomir. Thanks, this is a good explanation. So the moniker has a clear conceptual background.